The sheer number of ERP software solutions out there can make even the most seasoned IT and business software professionals’ head spin. Between the established software publishers and the new guys touting the latest and greatest cloud technology, the task of choosing the right ERP software for your organization is harder than ever. What works perfectly for one company may not fit for you, your industry, or your workflow processes. So to help break it all down for you, here’s how Sage Intacct vs NetSuite – two of the most popular Cloud financial solutions on the market today – stack up. Note: Because features, functions, and technology are constantly changing, we recommend full diligence that matches your business requirements with the software capabilities to select the best solution. If you were to look at a grid that stacks the features of Sage Intacct vs NetSuite side-by-side, you’d probably discover that both products offer very similar functionality when it comes to accounting and financials. In fact, many of the product comparisons you’ll see online suggest parity between the two applications. Note: Market focus and company viability are important because it represents how publishers manage expenses, the availability and allocation of funding to R&D, and likelihood that the publisher will continue investments that enhance the customer experience. Sage (SGN:LN), publisher of Intacct, is a publicly-held company currently traded on the FTSE 100 and has posted steady, predictable growth year-after-year since 1989. Sage is the 3rd largest ERP software provider worldwide in terms of revenue ($2.3B) and #1 with a base of more than 6M customers worldwide. Sage acquired Intacct to strategically fill a void in its portfolio; a true financials in the Cloud solution for the midmarket. Oracle (NYSE: ORCL), publisher of NetSuite, is a publicly-traded company with revenues of $11B and 430,000 customers worldwide. A multinational technology company, Oracle’s portfolio includes operating systems, databases, software programming languages, and various legacy ERP applications. Oracle’s track record with cloud acquisitions causes concern for NetSuite partners and customers. Will its future befall predecessors like Siebel and PeopleSoft or will Oracle encourage migrations to its Cloud platforms? ADVANTAGE = SAGE – With more midmarket ERP customers than any other publisher in the world, Sage is singularly focused on expertly developing, enhancing and supporting its ERP portfolio practice and customers every day. Sage Intacct is recognized as a leader among cloud solutions by G2 Crowd, an independent business software review platform. More recently, in G2 Crowd’s customer reviews, Sage Intacct earned the highest rated customer satisfaction, scoring a 98 (out of possible 100) from 375 customers. In comparison, NetSuite’s customer satisfaction scores were 66% and have been as lows as 43%. G2 Crowd does recognize NetSuite as a leader in market presence, though. ADVANTAGE = Sage Intacct – Most companies that have been through an ERP implementation in the past recognize that a publisher that delivers the best software product and customer experience tends to outperform a publisher that is well known and recognizable in the industry by brand. 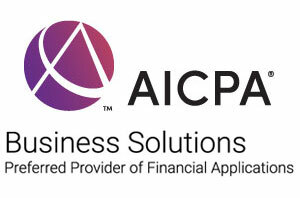 Only Sage Intacct is recognized by the AICPA as the Preferred Provider of Financial Applications. Since 2009, Sage Intacct is the first and only solution endorsed by the American Institute of Certified Public Accountants. This prestigious designation compliments our core values and validates our Services organization origins within a CPA firm. ADVANTAGE = Sage Intacct – An organization with the highest standards and integrity when it comes to financial accounting, the AICPA does not offer product recommendations lightly. Their endorsement of Sage Intacct sends a powerful message to CPA firms, AICPA members, and any organization choosing Intacct as their financials in the cloud management solution. When comparing costs of Sage Intacct vs NetSuite, it’s important to note how bundles and options impact subscription licensing. Sage Intacct is conveniently priced by bundle and users with few options. By comparison, NetSuite offers attractive user pricing but there are over 200 SKUs of add-ons that quickly drive up the subscription price. Sage Intacct only offers annual contracts so you’re not locked into a long-term investments (and likely large subscription increases at renewal time). NetSuite – bundle pricing ranges from $999 to $14,999 per month depending on the Edition plus user licenses per month. Popular additional options include Commissions ($199/month), Advanced Financials ($199/month) plus Premium Phone Support (22.5% to 37.5% of the net license cost). Sage Intacct – accounting pricing bundles begin at $2,520 annually plus user licenses with very few ala carte options. All Sage Intacct subscriptions include Phone Support without additional fees. *Note: cost calculations performed based on information available as of November 2017. Please check with a Sage or NetSuite authorized partner for a quote or current pricing. Request a Demo and explore Sage Intacct as your first and last Cloud Financial Management solution. You can decide which product delivers the knock out blow for your company. Leave your name below and one of our consultants will follow up to schedule a product demo or answer your questions.